Heat a medium stockpot on the stovetop over medium heat. Add butter and melt. Add orzo and saute until orzo just begins to brown, about 1-3 minutes. Add vegetable broth and white wine; stir. Reduce heat to medium low. Cover and simmer, stirring occasionally, until all the liquid is absorbed, about 15-20 minutes. Remove pasta from heat. Stir in Parmesan cheese, basil, sun-dried tomatoes and salt and pepper to taste. I heart this pasta so much (get it?). 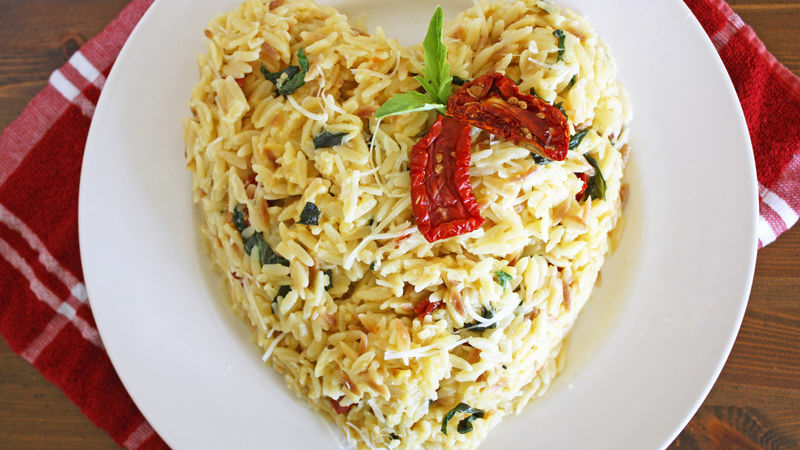 But seriously, this Orzo with Basil, Parmesan & Sun-Dried Tomatoes is Oh. So. Delicious. It’s creamy and cheesy and pasta-y and keeps your insides cozy, like a good comfort food should. It’s the perfect dinner to make for you and whoever has stolen your heart this Valentine’s Day. Plus, it’s super easy to make – like, you can spend more time just deciding what to wear for your date (even if that means sweatpants) than you will prepping dinner. WIN. OK firstly, take a look at all the goodness that goes in here. This isn’t even all of it! There’s also butter and white wine involved. Uh huh. Melt some butter in a medium stockpot on the stovetop, like so. Then add the orzo pasta and sauté it for a few minutes until it starts to brown. Note: PAY ATTENTION here. I’d have a photo of this browning situation for you but it happened TOO FAST and I had to pump the brakes on everything by dumping in the broth and wine. Whew. It was a close one. Anyschways, bring the whole mixture to a simmer and cook, stirring a few times, until the orzo soaks up all the liquid and it turns into this rich, creamy miracle of miracles. Stir in the Parmesan cheese, chopped fresh basil and chopped sun-dried tomatoes, as well as some salt and pepper. Voila! A romantic, delicious dinner in two shakes. Even if it’s with your Mom, your bestie, your cat or your favorite snuggie. Stephanie (aka Girl Versus Dough) is deeeeeefinitely wearing sweatpants on Valentine’s Day. Check out Stephanie’s Tablespoon member profile and keep checking back for her own personal recipes on Tablespoon!